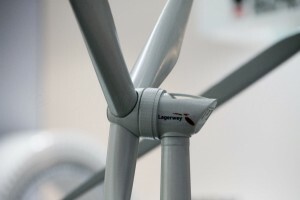 The wind turbine L160 LP4 is a production of Lagerwey, a manufacturer from Netherlands. This manufacturer has been in business since 1979. The rated power of Lagerwey L160 LP4 is 4,00 MW. At a wind speed of 2,5 m/s, the wind turbine starts its work. the cut-out wind speed is 25 m/s. The rotor diameter of the Lagerwey L160 LP4 is 160 m. The rotor area amounts to 20.106 m². The wind turbine is equipped with 3 rotor blades. The Lagerwey L160 LP4 is fittet with a direct drive gearbox. In the generator, Lagerwey sets to synchronous permanent. The manufacturer has used one generator for the L160 LP4. At the mains frequency, the L160 LP4 is at 50 Hz. In the construction of the tower, the manufacturer uses Modular Steel Tower (MST). Manufacturer of the tower is Lagerwey. There is one picture of the wind turbine L160 LP4. One model has been entered to the wind turbine. This is the Lagerwey L160 LP4 - Fair model. Power data for the L160 LP4 of Lagerwey are not stored in the system. The Lagerwey L160 LP4 has been listed since 30.09.2018. The last modification of the master data was made on 09.02.2019.